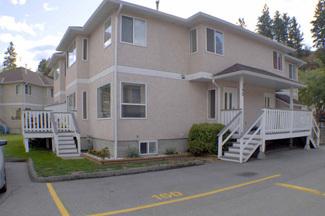 Nicely updated three bedroom townhome located in Cascade Gardens, a family friendly complex where pets are also permitted. This unit was just freshly painted throughout and is move-in ready! Finished basement with laundry and spacious rec room. Master bedroom with 2-piece ensuite and walk-in closet. Extended deck offers enough room for your patio set and BBQ. Parking for two vehicles conveniently located right beside the unit. Quick possession possible.